This year includes a night of all African electronic artists at Villain, a GHE20G0TH1K’s biggest ever party which will happen at BK Bazaar with a big lineup including New Orleans Bounce ‘sissy rapper’ Sissy Nobby‘s first-ever NYC appearance, the premiere of a new Kid Millions (of Oneida) piece with 20 musicians, a conversation with A$AP Rocky, a PC Music showcase with all their artists and SOPHIE at BRIC House, a conversation with George Clinton, the biggest-ever Nothing Changes party at Output with Merzbow and many others, a Tri Angle Records 5th anniversary party on Wall Street with most of the label’s roster, the return of Frankie Bones’ Storm Rave party, the debut of FKA twigs’ new live show with dancers and more, an Arthur Russell tribute with Dev Hynes, Cults, Phosphorescent (UPDATE: Phosphoresent was initially listed as part of this but is no longer on the lineup), Sam Amidon, Little Scream and more. May 1: Electronic Africa with Nozinja, Islam Chipsy and EEK, Titica, DJ Spoko, Chief Boima, Dubbel Dutch @ Villain: Africa has long been a source of musical innovation, and thanks to the global proliferation of music production software, a new wave of raucous young artists have bubbled to the surface. While it’s impossible to survey the entire continent, Electronic Africa aims to bring a few of the most exciting new artists to New York. DJ Spoko and Nozinja will represent South Africa, the former offering his own uniquely infectious spin on kwaito, the latter making his New York debut with the fast-paced shangaan electro genre that he’s largely credited with creating. Also performing for the first time on US soil is Egyptian synth wizard Islam Chipsy, who will present his blistering take on the country’s electro chaabi sound alongside his band, EEK. Rounding out the international bill is Titica, an Angolan transgender singer and dancer known for her moves in the country’s vibrant kuduro scene. May 2: GHE20G0TH1K with Sissy Nobby, Venus X, Total Freedom, MikeQ, Ma Nguzu, Divoli S’vere @ Brooklyn Bazaar: As one of NYC’s most influential and style-defining parties of the last decade, the GHE20GOTH1K name rings out way beyond the five boroughs. Founded by Venus X in 2009 (and famously put to rest in response to increased mainstream hijacking of its aesthetic), the night was at the epicenter of a New York subculture that would leave its mark on the worlds of music, fashion, art, tech and design. Hood By Air, DIS Magazine, Fade To Mind and UNO NYC are just a few of the more prominent collectives whose members found a common meeting ground in the dark, hybrid, dynamic and cyber-obsessed space provided by GHE20GOTH1K. Red Bull Music Academy is excited to join forces with Venus X as she revives her party for a special, one-off night at Brooklyn Bazaar, headlined by New Orleans bounce pioneer Sissy Nobby’s first NYC appearance. May 3: 100 Disciplines: A Composition for 20 Performers by Kid Millions, Niños Du Brasil @ Beaux-Arts Court at Brooklyn Museum: Kid Millions would like you to check all preconceived notions of what drums can sound like at the door. The first ever original work commissioned for the Red Bull Music Academy Festival New York, the acclaimed drummer will bring a troupe of percussionists to Brooklyn Museum’s magnificent Beaux-Arts Court, generating sound by exploring a myriad of ways to draw feedback, drones and overtones. Says Millions, 100 Disciplines serves as “a programmatic memory map of my last 20 years in New York City and will include a host of non-specific references to the tragicomic facets of living in a place that’s both a source of inspiration and overwhelming difficulty. The title refers to the host of methods and tactics one might draw upon to navigate this city as a creative artist.” The exuberant Italian bachata-influenced electronic duo Niños du Brasil opens. May 6: A Conversation with La Monte Young @ Red Bull Studios New York: La Monte Young’s hugely influential work began in the ’50s, studying under Karlheinz Stockhausen. He is often credited as the very first minimalist composer, and his name is inextricable from drone music. Brian Eno once called him “the daddy of us all,” and it makes sense: Young is the starting point for the Velvet Underground, Philip Glass, and so many more. In this talk, he’ll chart a course through his career and present audio acoustical demonstrations of various phenomena including but not limited to the presentation of intervals, harmonics and ragas. 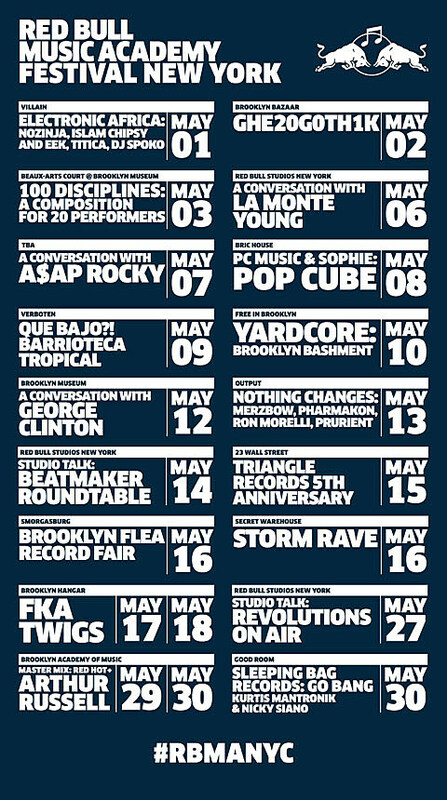 May 7: A Conversation with A$AP Rocky (Location TBA): Among the young torchbearers of NYC’s prestigious rapping tradition, A$AP Rocky’s light shines the brightest. Stepping on to the scene with a fully-formed vision and a mouth full of gold, the charismatic MC’s rapid ascent to style icon has made him the face of Harlem hip hop in the post-Dipset era. For one special evening as part of the Red Bull Music Academy Festival New York, Harlem’s best-dressed wordsmith will take a seat on the lecture couch to speak candidly about his manifold influences in music and fashion – and life at the top of hip hop’s food chain. *Note: Tickets for this event will go on sale at a later date. May 8: PC Music & SOPHIE: Pop Cube @ BRIC House: The prolific, confounding and often brilliant crew PC Music is impossible to pin down. The same goes for SOPHIE. Both play with ideas about pop cultural iconography, flip bubblegum pop on its head, and turn blindingly bright synths into sparkling moments of harsh beauty. And now they may be morphing into a television network right in front of our eyes. Curious about what that means? This all-encompassing night will bring their sound and aesthetic to life in a way that you’ve never seen before. Join SOPHIE and pretty much the entire cast of the label at downtown Brooklyn media and arts space BRIC House to participate in the spectacle. May 9: Que Bajo?! : Barrioteca Tropical with DJ Playero, DJ Laz, Erick Rincon, Happy Colors, Pablitomix, Notch, Uproot Andy, Geko Jones, and more @ Verboten: Since 2008, Que Bajo?! has been carrying the torch for upfront tropical sounds in New York City, as co-founders and resident DJs Uproot Andy and Geko Jones routinely power their dancefloor with a hip-shaking mix of cumbia, reggaeton, salsa, bachata, dancehall, baile funk, merengue, mambo, kuduro, kwaito, funana, tribal guarachero, and other styles too numerous to list. For this special edition, Andy and Geko will be joined by an all-star line-up that includes Puerto Rican reggaeton pioneer DJ Playero, Miami Latin bass king DJ Laz, Mexico’s Erick Rincon from 3BallMTY, Happy Colors, Pablitomix, Notch, and more. May 10: Yardcore: Brooklyn Bashment with King Jammy, Assassin, Spice, Lisa Hype, Tifa, Kranium, Ricky Blaze, Mixpak Sound, Federation Sound: Jamaica might be the original home of dancehall, but New York City can certainly lay claim to some of the genre’s shining moments. Now we’re bringing a wide range of current, future and pioneering dancehall artists together for a massive, free daytime party under the Brooklyn skies. Featuring a special set by dub master and sound system ruler King Jammy, the event will also include performances from Jamaica’s Assassin, Spice, Lisa Hyper, and Tifa, and Brooklyn’s Kranium, Ricky Blaze, Mixpak Sound, and Federation Sound. May 12: A Conversation with George Clinton @ Brooklyn Museum: Music as we know it would look a lot different (and less colorful) without the contributions of George Clinton. From his early musical beginnings in doo wop and as a songwriter at Motown, the hugely prolific Clinton went on to form the bands Parliament and Funkadelic, two of the most important groups of the 1970s. With Clinton at the helm of their Mothership, they uprooted funk from its earthly origins, sending it into outer space. Having made P-Funk a household name, Clinton went on to build an impressive solo discography, all the while inspiring a legion of West Coast rap artists and holding the reins of a sensational band called the P-Funk All Stars. As part of the Red Bull Music Academy Festival New York, George Clinton will sit down on the lecture couch for a rare, intimate chat about his momentous life and career. 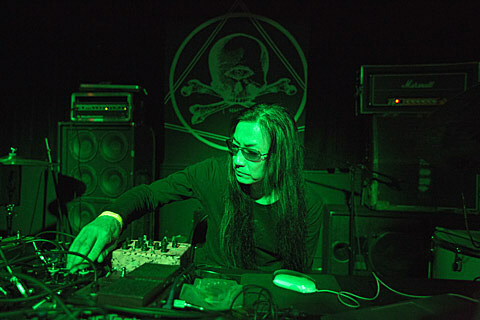 May 13: Nothing Changes: Raw Sound Transgression with Merzbow, Genesis P-Orridge & Aaron Dilloway (Wolf Eyes), Prurient, Pharmakon, Ron Morelli, Marshstepper, Uniform, and more @ Output: New York isn’t as grimy as it once was, but that doesn’t mean there aren’t still musicians and parties that explore the ragged edges of our city. The Nothing Changes party has been hosting some of the weirdest and wildest for over two years, and now they’re taking advantage of New York City’s club best sounding club with a lineup of experimental luminaries like Japanese noise pioneer Merzbow, Genesis P-Orridge & Aaron Dilloway of Wolf Eyes (performing Psychic TV’s Electric Newspapers for the first time), Ron Morelli, Pharmakon, Prurient (presenting his seminal album Pleasure Ground for the first time), Marshstepper, Uniform, and more, all brought together on one explosive sound system for the first, but hopefully not last time. May 14: Studio Talk: Beatmaker Roundtable, presented with Native Instruments @ Red Bull Studios New York: Hip-hop producers tell the secrets behind their beats, their song-making process, and collaborating with others, with hands-on demonstration on the gear they use to make some of the street’s biggest hits. May 15: Tri Angle Records 5th Anniversary with The Haxan Cloak, Evian Christ, Holy Other, Vessel, Forest Swords, Bothhodyd, mssingo, Lotic, Rabit, Hanz and special guests @ 23 Wall Street: A lot of labels have come and gone during the past five years, but very few of them have had the impact of Tri Angle Records. The imprint has forged a path that has repeatedly unearthed intriguing new artists while connecting the dots between atonal noise, leftfield R&B and hip-hop, brooding atmospherics, and hauntingly emotive pop. In honor of the label’s fifth anniversary, Red Bull Music Academy is bringing together a collection of some of Tri Angle’s brightest talents, including The Haxan Cloak, Holy Other, Evian Christ, Forest Swords, Vessel, and more. This high-profile assemblage will be taking over the basement and vault of the former J.P. Morgan building across the street from the New York Stock Exchange. May 16: Brooklyn Flea Record Fair with Eamon Harkin (Mister Saturday Night), Justin Miller (Have A Killer Time), Jefre Cantu-Ledesma (Mexican Summer), Matt Werth (RVNG), and more @ Smorgasburg: Most of the fun at this year’s Red Bull Music Academy Festival New York is scheduled to take place after dark, but the calendar wouldn’t be complete without a return trip to the Williamsburg waterfront for an afternoon at the Brooklyn Flea. This will be our third time at this vast and varied record fair, which will once again feature more than 50 independent record labels, high-quality eats from the folks at Smorgasburg, and music provided by DJs we’ve enlisted especially for the occasion. This year’s selectors include Have A Killer Time label boss Justin Miller and Mister Saturday Night’s Eamon Harkin, alongside the dreamy noise of Jefre Cantu-Ledesmna, innovative label RVNG’s founder Matt Werth, and more. With these gentlemen behind the decks, it’s a safe bet that New York City’s vinyl diehards will be greeted by plenty of deep cuts and feel-good vibes. May 16: Storm Rave with Frankie Bones, Adam X, Heather Heart, Lenny Dee, Rob Gee: Brooklyn’s recent wave of noisy, abrasive techno owes a massive debt to Frankie Bones, who began throwing massive underground parties in the borough before many of today’s young producers were even born. In the early ’90s, Bones effectively brought rave culture to New York with Storm Rave, a series of wild warehouse events that played host to thousands of attendees – not to mention a steady stream of world-class DJs – while educating an entire generation about a new way to party. Soundtracked by hard, punishing techno and often taking place in suffocatingly cramped and disorienting spaces, these clandestine all-night affairs only lasted for a few years, yet they left an indelible mark on New York City nightlife. Now, 22 years after the last Storm Rave, we’re proud to help bring the event back. True to the spirit of the original series, we’ll be taking over an undisclosed warehouse location somewhere in the city. Naturally, Bones himself will be behind the decks, but he’ll be joined by an elite crew of fellow New York techno pioneers, including Adam X, Heather Heart, Lenny Dee, and Rob Gee. May 17 & May 18: FKA Twigs @ Brooklyn Hangar: It feels like FKA Twigs’ rise from experimental R&B mystery woman to a genuine star pushing the boundaries of pop music happened so quickly that we still haven’t caught up. Now, over the course of two nights, the singer/dancer/producer/choreographer/director will perform two very special concerts at the Brooklyn Hangar. The exciting next step in her evolution, we’ve given her complete freedom to bring her radical vision to the stage. Accompanied by ten dancers, costumes by Alexander McQueen, and spectacular visuals, this original production not only will this sound like the future, it’ll look like it too. May 27: Studio Talk: Revolutions On Air, New York City Radio 1980-1984 @ Red Bull Studios New York: The early ’80s was a uniquely fertile time for music, with a plethora of new and exciting genres – dance, electro, and hip hop – developing all at once. Ingenuity was coming from clubs and the street, and new sounds were being tested out in front of millions listening to the radio. As a companion piece to the Red Bull Music Academy upcoming documentary Revolutions On Air, New York City Radio 1980-1984, we invite the era’s most important players for a roundtable discussion. May 29 – May 30: Master Mix: Red Hot + Arthur Russell with Dev Hynes, Cults, Thao Nguyen, Little Scream, Richard Reed Parry, Sam Amidon, Rubblebucket, and more @ Brooklyn Academy of Music: The epitome of a postmodern musician, Arthur Russell changed the rules in his much-too-brief lifetime. The Iowa-born composer, cellist and singer entered the Downtown NYC scene in the 1970s – and by the time he passed away in 1992, his influence had permeated virtually every aspect of it. Be it as the musical director of experimental art space The Kitchen; collaborator to Allen Ginsberg, David Byrne, and Ali Akbar Khan; disco innovator with his Loose Joints and Dinosaur L projects; or extraordinary solo musician – Arthur Russell was a master of many trades. To honor his legacy, the Red Hot Organization released the compilation Master Mix: Red Hot + Arthur Russell, featuring more than 20 artists paying musical tribute. Over the course of two special evenings at BAM, the Red Bull Music Academy teams up with Red Hot to bring together an all-star cast of musicians to bring the compilation to life. May 30: Sleeping Bag Records: Go Bang with Kurtis Mantronik, Nicky Siano, Morgan Geist, and more @ Good Room: After you’re done paying tribute to one side of Arthur Russell’s diverse body of work at Brooklyn Academy of Music, head over to Good Room for a celebration of another. Sleeping Bag – the label Russell co-founded with Will Socolov and Juggy Gales in 1981 – sat at the intersection of hip-hop and dance music, releasing work from a jaw-dropping roster that would come to exemplify what it meant to live and make music in New York at the time. From Mantronix, Just-Ice, T La Rock and EPMD to Nocera, Joyce Sims, and Kariya, Sleeping Bag, and sister label Fresh Records, was responsible for kickstarting the career of so many brilliant artists. Join pioneering hip hop producer Kurtis Mantronik and disco missionary Nicky Siano as they look back at the influential label in their DJ sets. The past never sounded so much like the future.